Stamping dies are subjected to an array of stresses, temperatures, chemicals, shock and vibrations. So we should not be surprised when the dies experience all kinds of in-process failures. When tooling components fail prematurely, the stamper must perform a complete failure analysis and properly identify the failure mode(s) in order to properly repair the tooling and maintain optimum performance. Unfortunately, the immediate response for many failures is to repair or replace the damaged or broken component as quickly as possible so that production may resume. Under these time-pressured conditions the stamper often fails to perform a properly devised investigation, which usually results in important evidence being discarded or destroyed. Collect samples—The failed die component (broken, twisted, bent, galled, chipped, scored, etc.) is the primary failure sample because it either is the failure site, or it contains the failure site. Also desirable: a sample part of a similar component which has not failed, preferably one that has run successfully in production. When producing replacement parts in batch lots, the stamper should take a sample from the replacement-parts bin for comparative analysis. Compile background data—Time spent collecting background data proves vital to the success of any failure analysis. Your technicians should have a thorough understanding of the entire manufacturing process and the service histories of the failed component(s). They should reconstruct, as much as is possible, the entire sequence of events leading up to the failure. Getting acquainted with the manufacturing process may require the investigator to obtain die-detail drawings, technical specifications, component process-flow diagrams and all relevant fabrication information. This includes the die materials used, machining methods employed, heattreatment-process parameters and surface-treatment data, including the application methods. The ability to accurately complete a service history will depend on how detailed the recordkeeping was in the plant prior to the failure. In collecting service histories, environmental details prove particularly important. These include normal and abnormal loading, accidental overloads, cyclic loading, in-process temperature variations and die-grinding and sharpening practices. • Those that fail in service. Design faults that cause failures from heattreatment include the presence of thick sections adjacent to thin sections; sharp corners; blind holes; stamp marks; fillets with radii that are too small; poorly located or designed grooves or notches; abrupt changes in crosssection; and the location of holes that result in thin walls. 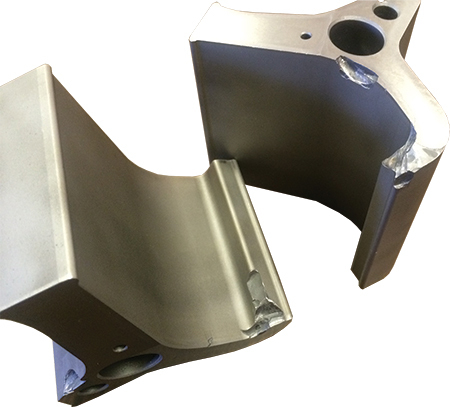 Design faults that cause service failures include inadequate fillets in corners; improper clearance (especially if thermal expansion is involved, which is the case with many stamping operations); thin sections; and abrupt changes in crosssection. Nondestructive testing—These processes allow for the evaluation of surface finish and dimensional specifications without destroying the sample. Mechanical testing—Tool design and tool-steel selection often receive the most attention from the die shop, while heattreatment is taken for granted. This typically occurs because the heattreat process is least understood and almost always outside of their direct control. It is, therefore, critical to investigate the materials and heattreatment methods used for the failed application. Other processes for assessing heattreatment results include surface-hardness and toughness testing. Assess the failure conditions—It often proves beneficial to compare a failed component with one that has not failed in order to asses if a failure occurred due to service conditions or to a manufacturing error. An example of a manufacturing error: a highly stressed area in a die detail that cracks or chips in service because a radius specified in the corner of the component was inadvertently left sharp. 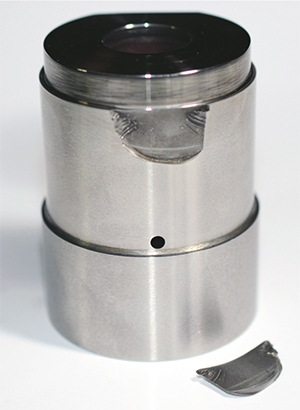 An example of a service-condition failure: A stamper uses a chlorinated stamping lubricant in a die containing tungsten-carbide tooling. The chlorine can attack the cobalt binder, causing the die component to crack or chip. • Testing under simulated service conditions. Analyze all of the evidence—With all of the data gathered, the investigator must come to a conclusion based on the evidence present. This step can be difficult—when conducting the investigation, some clues may lead the investigator down paths that seem to lead to the cause, but instead are merely consequences.